You are at:Home»iPhone»Power»How To Turn Off Your iPhone Without A Power Button: The Quick Fix! You want to shut down your iPhone, but the power button is broken. Even if your power button isn’t working, Apple has created ways for you to safely turn off your iPhone. 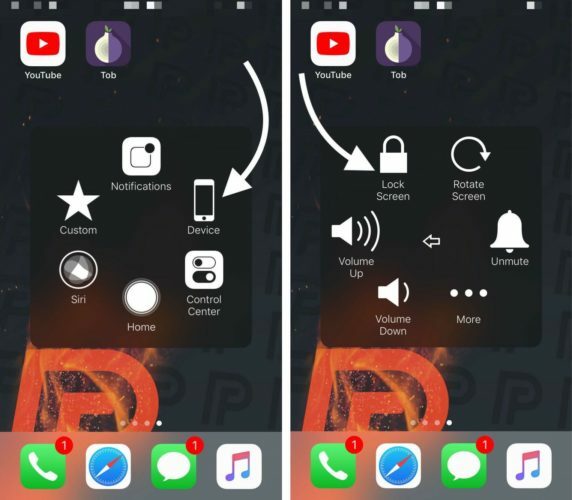 In this article, I’ll show you how to turn off your iPhone without a power button! How Do I Turn Off My iPhone Without A Power Button? 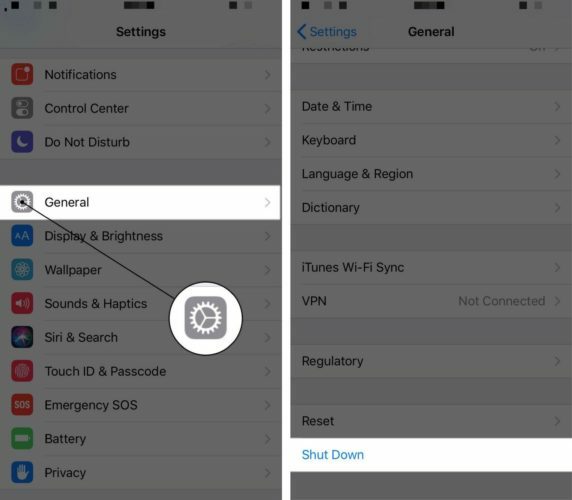 There are two ways to turn off your iPhone without a power button. You can do so in the Settings app, or by using the virtual AssistiveTouch button. This article will walk you through both methods using step-by-step guides! If your iPhone is running iOS 11, you can turn off your iPhone in the Settings app. Go to Settings -> General and scroll all the way to the bottom of the screen. Then, tap Shut Down and swipe the power icon from left to right. You can also use AssistiveTouch, the virtual iPhone button, to shut down your iPhone. If it’s not already set up, we’ll have to turn on AssistiveTouch. Go to Settings -> General -> Accessibility -> AssistiveTouch and turn on the switch at the top of the screen to the right of AssistiveTouch. 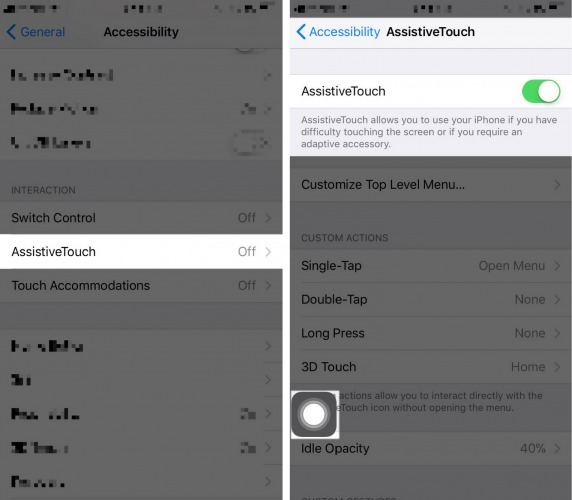 Now that AssistiveTouch is on, tap the button that has appeared on your iPhone’s display. Then tap Device and press and hold Lock Screen. Swipe the power icon from left to right across slide to power off to shut down your iPhone. How Do I Turn My iPhone Back On? Now you’ve turned off your iPhone, you’re probably wondering how you’re going to turn it back on with no functioning power button. Don’t worry — iPhones are designed to automatically turn back on when you connect them to a power source. When you’re ready to turn your iPhone back on, grab a Lightning cable and plug it into your computer or wall charger. Shortly after, the Apple logo will appear on the center of the screen and your iPhone will turn back on. Unless you’re happy to put up with AssistiveTouch forever, you’ll probably want to get your iPhone’s power button repaired. Set up an appointment to get it fixed at your local Apple Store if your iPhone is covered by AppleCare+. If your iPhone isn’t covered by AppleCare+, or if you want to have your iPhone fixed as soon as possible, we recommend Puls, an on-demand repair company. Puls sends a certified technician straight to you, whether you’re at work, home, or a local restaurant. Puls repairs come with a lifetime warranty and are sometimes cheaper than the price you’re quoted at the Apple Store! No Power Button, No Problem! Congratulations, you’ve successfully shut down your iPhone! I encourage you to share this on social media to teach your family and friends how to turn off their iPhone without a power button. Thanks for reading! Previous ArticleMy iPad Won’t Rotate! Here’s The Real Fix. Next Article Apple Music Not Working On iPhone? Here’s The Real Fix!